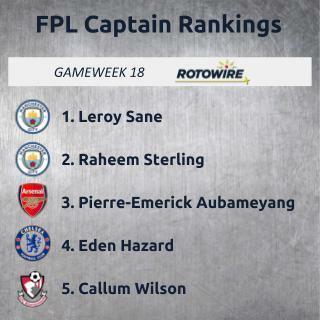 Things are about to get crazy in the Premier League, even more so than last gameweek when Xherdan Shaqiri and Henrikh Mkhitaryan both scored braces, while their more popular teammates failed to make the score sheet. The fixture pileup over the next two weeks will see a number of players rested when you least expect it. That means you can either take a risk with the bigger names or decide to captain a defender who is more likely to make the starting XI. The good news for Gameweek 18 is that all of the big clubs are in great positions to produce. Arsenal (v. Burnley), Chelsea (v. Leicester) and Manchester City (v. Crystal Palace) are all at home while Liverpool (at Wolves) and Man United (at Cardiff) are in somewhat decent positions. I'd throw Tottenham (at Everton) in the mix, but I'd rather captain someone else from the aforementioned mix. Not to mention, Harry Kane was ill in the middle of the week so he's already hard to trust. The bad news is that the League Cup quarterfinals took place in midweek, with Leicester hosting Man City on Tuesday, and then on Wednesday, Tottenham went to Arsenal and Bournemouth to Chelsea. I'm not completely worried about those matchups, but it's something to keep in the back of the mind since they come at the worst possible time. Still, the most intriguing place to look, as usual, is Man City against a Palace side that has allowed three goals in three of its last four away matches. Sergio Aguero returned to the starting XI and played 76 minutes Tuesday, and that means he and Gabriel Jesus have the same odds to start Saturday. Both will be in the conversation, but Leroy Sane may be more likely to play 90 minutes after not making the bench against Leicester. It's also likely Raheem Sterling starts after he went 66 minutes Tuesday, while Riyad Mahrez played the entire way. Based on expected minutes played, I'd throw Sane to the top of the list with Sterling and Aguero close behind. Arsenal are just as hard to predict after Mkhitaryan's recent showing that also saw Pierre-Emerick Aubameyang fail to make the score sheet. I'm still backing Aubameyang because he at least had two shots on goal and a couple chances created while Burnley have allowed the most shots and chances created by far this season. I don't feel comfortable putting any other Gunner into the mix for the armband because neither Alexandre Lacazette nor Mkhitaryan are guaranteed starts. Even then, Mkhitaryan is averaging just 0.75 shots on goal per 90 minutes, worse than Aubameyang's 1.17 rate. Nacho Monreal is back from injury and could be worth a look since Arsenal actually play defense at home and Burnley average fewer than one goal per match. The problem with Chelsea is that only Eden Hazard is worth captaining, and he picked up a minor knock last match. He does a little bit of everything for the Blues and as long as he's in contention to start, he should be in the mix. I'd consider Marcos Alonso because Leicester haven't scored in their last two, but he's been underwhelming for a couple months and has just one shot on goal and one chance created in his last five starts. Liverpool are in a tricky spot because Wolves are once again in form and have already held teams like Man City and Chelsea to one goal at home. Mohamed Salah is always in the conversation, but there are better matchups. That said, I'm still looking at Salah before anyone on Man United because you never know what you're going to get. First, it was Anthony Martial, and then it was Marcus Rashford. At Cardiff, Romelu Lukaku will probably snag a goal after having no shots in his last two starts (UCL included). I'm much more inclined to give the armband to someone from Bournemouth (v. Brighton) or West Ham (v. Watford). The Cherries got Callum Wilson back last weekend and that can only mean good things ahead, already with eight goals and five assists, matching last season's goal total and more than doubling his assists. Brighton are playing somewhat decently, but a lot of that has to do with their schedule, as their last three road trips were to Burnley, Huddersfield and Cardiff. Bournemouth are looking to rebound after a couple bad losses, though a midweek League Cup trip to Chelsea is somewhat worrying for Wilson's health. West Ham are in almost as good of a situation since Watford have given up multiple goals in their last five matches and the Hammers are on a nice run, having won their last four. The absence of Marko Arnautovic surprisingly didn't change anything, only that Chicharito took over lead forward duties and he's the last person anyone can trust. The best option has been Robert Snodgrass, who had two goals and three assists in his last four starts. The goals probably won't keep coming, but as the main corner taker, he'll continue to create multiple chances each match. Felipe Anderson gets more looks on net, but Snodgrass still feels a little safer because of the set pieces. For the weekly Aleksandar Mitrovic update, I don't think he scores at Newcastle, mostly because he hasn't scored on the road since Sept. 1.